Dwight David Howard (born December 8, 1985) is an American professional basketball player for the Atlanta Hawks of the National Basketball Association (NBA). Howard, who plays center, had an outstanding high school career at Southwest Atlanta Christian Academy. He chose to forgo college and entered the 2004 NBA draft, and was selected first overall by the Orlando Magic. An eight-time All-Star, eight-time All-NBA team selection, five-time All-Defensive member, and three-time Defensive Player of the Year, Howard has been ranked consistently as one of the best in the league in rebounds, blocks, field goal percentage and free throw attempts, and has set numerous franchise and league records. He led the Magic to three division titles and one conference title, and he was the winner of the 2008 NBA Slam Dunk Contest. In the 2008 Olympics, he was the starting center for Team USA, which went on to win the gold medal. He was traded to the Los Angeles Lakers in 2012, and signed with the Rockets in 2013. Howard was born in Atlanta, to Dwight Sr. and Sheryl Howard, and into a family with strong athletic connections. His father is a Georgia State Trooper and serves as Athletic Director of Southwest Atlanta Christian Academy, a private academy with one of the best high school basketball programs in the country, while his mother played on the inaugural women's basketball team at Morris Brown College. Howard's mother had seven miscarriages before he was born. A devout Christian since his youth, Howard became serious about basketball around the age of nine; when in the eighth grade, he resolved to be selected as the number one pick in the NBA Draft one day. Despite his large frame, Howard was quick and versatile enough to play the guard position. He elected to attend Southwest Atlanta Christian Academy for high school, and in his four years he played mostly as power forward, averaging 16.6 points per game (ppg), 13.4 rebounds per game (rpg) and 6.3 blocks per game in 129 appearances. As a senior, Howard led his team to the 2004 state title. He averaged 25 points, 18 rebounds, 8.1 blocks and 3.5 assists per game. That same year, Howard was widely recognized as the best American high school basketball player, and he was awarded the Naismith Prep Player of the Year Award, the Morgan Wootten High School Player of the Year Award, Gatorade National Player of the Year and the McDonald's National High School Player of the Year honor. He was also co-MVP (with J. R. Smith) of the McDonald's High School All-American Game that year. On January 31, 2012, Howard was also honored as one of the 35 greatest McDonald's All-Americans. Following his high school successes, Howard chose to forego college and declared for the 2004 NBA draft—a decision partly inspired by his idol Kevin Garnett who had done the same in 1995—where the Orlando Magic selected him first overall over UConn junior Emeka Okafor. He took the number 12 for his jersey, in part because it was the reverse of Garnett's 21 when he played for Minnesota. Howard joined a depleted Magic squad that had finished with only 21 victories the previous season; further, the club had just lost perennial NBA All-Star Tracy McGrady. Howard, however, made an immediate impact. He finished his rookie season with an average of 12.0 ppg and 10.0 rpg, setting several NBA records in the process. He became the youngest player in NBA history to average a double double in the regular season. He also became the youngest player in NBA history to average at least 10 rebounds in a season and youngest NBA player ever to record at least 20 rebounds in a game. Howard's importance to the Magic was highlighted when he became the first player in NBA history directly out of high school to start all 82 games during his rookie season. For his efforts, he was selected to play in the 2005 NBA Rookie Challenge, and was unanimously selected to the All-Rookie Team. He also finished third to fellow center Emeka Okafor of the Charlotte Bobcats and guard Ben Gordon of the Chicago Bulls for the Rookie of the Year award. Howard with Magic teammate Jameer Nelson. 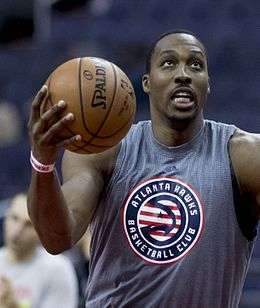 Howard reported to camp for his second NBA campaign having added 20 pounds of muscle during the off-season. Orlando coach Brian Hill—responsible for grooming former Magic superstar Shaquille O'Neal—decided that Howard should be converted into a full-fledged center. Hill identified two areas where Howard needed to improve: his post-up game, and his defense. He exerted extra pressure on Howard, saying that the Magic would need him to emerge as a force in the middle before the team had a chance at the playoffs. Even though the big man played tentatively at times, he was able to build on his strong rookie year with an impressive sophomore season. On November 15, 2005, in a home game against the Charlotte Bobcats, Howard scored 21 points and 20 rebounds, becoming the youngest player ever to score 20 or more points and gather 20 or more rebounds in the same game. He was selected to play on the Sophomore Team in the 2006 Rookie Challenge during the All-Star break, and on April 15, 2006, he recorded a career-high 26 rebounds against the Philadelphia 76ers; his 28 points in that game also brought him close to an NBA rarity, a 30–30 game. Overall, he averaged 15.8 points and 12.5 rebounds per game, ranking second in the NBA in rebounds per game, offensive rebounds, and double doubles; and sixth in field goal percentage. Despite Howard's improvement, the Magic finished the season with a 36–46 win-loss record and failed to qualify for the playoffs for the second consecutive season since Howard's arrival. Howard took another step forward as the franchise player for Orlando in the 2006–07 season, and for the third consecutive season he played in all 82 regular season games. On February 1, 2007, he received his first NBA All-Star selection as a reserve on the Eastern Conference squad for the 2007 NBA All-Star Game. Howard finished the game with 20 points and 12 rebounds. Less than a week later, he recorded a career-high 32 points against the Toronto Raptors. A highlight was his game-winning alley-oop off an inbound pass at the buzzer against the San Antonio Spurs at Amway Arena on February 9. As the push for playoff spots intensified, Howard was instrumental, recording another career-high 35 points against the Philadelphia 76ers on April 14, 2007. Under his leadership, the Magic qualified for the 2007 NBA Playoffs for the first time since 2003 as the number eight seed in the Eastern Conference. However, the Magic were swept by the eventual Eastern Conference finalist Detroit Pistons in the first round. Howard averaged 17.6 points and 12.3 rebounds per game, and finished first in the NBA in total rebounds, second in field goal percentage, and ninth in blocks. He was further recognized as one of the best players in the league when he was named to the All-NBA Third Team at the end of the 2006–07 campaign. Howard continued posting impressive numbers in the 2007–08 season; with free agent Rashard Lewis added to the ranks alongside Hedo Türkoğlu to provide an extra offensive spark, this was the Magic's best season yet. Howard's strong and consistent play ensured that he was named as a starter for the Eastern Conference All-Star team, and by the time the mid-season break arrived, he was leading the league in double doubles (he concluded the season with a league-high 69) and had recorded 20 points and 20 rebounds in a game on five occasions (eight by the season's end). On February 16, 2008, he won the 2008 NBA Slam Dunk Contest by receiving 78% of the fan's votes via text messaging or online voting; in that contest, he performed a series of innovative dunks said to have rejuvenated the contest, including donning a Superman cape for one of the dunks. Howard led the Magic to their first division title in 12 years and to the third seed for the 2008 NBA Playoffs, and in the first-round match-up against the Toronto Raptors, Howard's dominance (three 20 point/20 rebound games) and point guard Jameer Nelson's strong play ensured that Orlando prevailed over five games. Howard's series total of 91 rebounds was also greater than the total rebounds collected by the entire Toronto frontcourt. In the next round against the Pistons, the Magic lost the first two road games before Howard's 20 point/12 rebound performance in Game 3 salvaged a home win. In that same week, the center was named to the All-NBA First Team for the first time, and subsequently, the NBA All-Defensive Second Team. Detroit played without their star point guard Chauncey Billups for Games 4 and 5, but Orlando was unable to capitalize on that and lost the series 4–1 to the veteran playoffs team. The 2008–09 campaign began well for Howard. Ten games into the season, the center was leading the league in blocks per game (4.2) and even recorded his first triple-double: 30 points, 19 rebounds and 10 blocks. In December, he injured his left knee and missed the first game of his career after playing in 351 consecutive games. At the halfway point of the season, Howard was leading the league in rebounds and blocks, and was among the league leaders in field goal percentage. He garnered a record 3.1 million votes to earn the starting berth on the Eastern Conference team for the 2009 NBA All-Star game. On March 25, 2009, Howard led Orlando to its second straight Southeast Division title with 11 games of the regular season left to play, and eventually the third seed for the 2009 NBA Playoffs with a 59–23 record. On April 21, 2009, he became the youngest player ever to win the NBA Defensive Player of the Year Award, achieving a goal he had set for himself before the start of the season. The Magic went into the playoffs without its injured starting point guard Jameer Nelson, and in the first round against the 76ers, Howard recorded 24 points and 24 rebounds in Game 5 to give Orlando a 3–2 lead, before the Magic closed out the series in six games. On May 6, 2009, the center was named to the NBA All-Defensive First Team, and a week later, to the All-NBA First Team. In the second round of the playoffs against the defending champions Boston, the Magic blew a lead in Game 5 and Howard publicly questioned coach Stan Van Gundy's tactics and said that he should be given the ball more; in Game 6, the center posted 23 points and 22 rebounds to force the series into seven games. The Magic went on to defeat Boston, and then defeated Cleveland—which was led by league MVP LeBron James—4–2 in the Eastern Conference Finals. Howard had a playoffs career-high 40 points to go with his 14 rebounds in the deciding Game 6, leading Orlando to its first NBA Finals in 14 years. The Los Angeles Lakers took the first two home games to establish a 2–0 lead in the Finals, before a home win by the Magic brought the score to 2–1. In Game 4, despite Howard putting up 21 rebounds and a Finals-record of 9 blocks in a game, the Magic lost in overtime. The Lakers went on to win Game 5, and the NBA Finals. The Magic went into the 2009–10 season with one major roster change: Türkoğlu departed for the Toronto Raptors, while eight-time NBA All-Star Vince Carter arrived from the New Jersey Nets. As with the previous two seasons, the Magic got off to a strong start, winning 17 of their first 21 games, setting a franchise record in the process. He also picked up two Conference Player of the Week awards. On January 21, 2010, Howard was named as the starting center for the East in the 2010 NBA All-Star Game. Not long after the Magic completed the regular season with 59 wins and their third consecutive division title, Howard won the Defensive Player of the Year Award for the second straight year. He became the first player in NBA history to lead the league in blocks and rebounds in the same season twice—and for two years in a row. During the playoffs, the Magic defeated both Charlotte and Atlanta 4 games to none, in the first and second rounds respectively. In reaching the Conference Finals again, the Magic faced Boston—who had upset Cleveland in the Semifinals—Orlando lost the first three games, took the next two, but finally succumbed in Game 6. Howard boxes out JaVale McGee of the Washington Wizards. In the 2010–11 regular season, Howard posted career-highs in points and shooting percentages, but the Magic were unable to win their division for the fourth straight year. Although the Miami Heat won the division, the Magic won 52 games, and finished as the fourth seed in the Eastern Conference playoffs. However, the Magic lost to the Atlanta Hawks in the first-round of the playoffs. Howard led the NBA in technical fouls with 18 in the regular season, and received one-game suspensions after his 16th and 18th technicals. On January 12, 2012, Howard attempted an NBA regular season record 39 free throws against the Golden State Warriors. Howard entered the game making 42 percent of his free throws for the season and just below 60 percent for his career. The Warriors hacked Howard intentionally throughout the game, and he broke Wilt Chamberlain's regular season record of 34 set in 1962. (Shaquille O'Neal attempted 39 free throws in Game 2 of the 2000 NBA Finals.) Howard made 21 of the 39 attempts, and he finished with 45 points and 23 rebounds in the Magic's 117–109 victory. On January 24, 2012, Howard became the Magic's all-time scoring leader, surpassing Nick Anderson's 10,650 points. On March 15, 2012, on the day of the trading deadline for the 2011–12 NBA season, Howard signed an amendment to his contract, waiving his right to opt out at the end of the season and committing to stay with the Magic through the 2012–13 season. He had previously asked to be traded to the New Jersey Nets, and the Magic were prepared to trade him had Howard not signed the amendment, to avoid losing him as a free agent. On April 5, Van Gundy said that he was informed by management that Howard wanted him fired. During the interview, the center walked up and hugged his coach, unaware that Van Gundy had confirmed a report that Howard denied. On April 19, 2012, Howard's agent said that Howard would undergo surgery to repair a herniated disk in his back, and would miss the rest of the 2011–12 season, as well as the 2012 Summer Olympics in London. During the offseason, Howard again requested the Magic trade him to the Nets, who had relocated to Brooklyn. He intended to become a free agent at the end of the 2012–13 season if he was not traded to Brooklyn. On August 10, 2012, Howard was traded from Orlando to the Los Angeles Lakers in a deal that also involved the Philadelphia 76ers and the Denver Nuggets. The Lakers also received Chris Duhon and Earl Clark; the Magic received Josh McRoberts, Christian Eyenga, Maurice Harkless, Nikola Vučević, Arron Afflalo, Al Harrington, and draft picks; Philadelphia received Jason Richardson and Andrew Bynum; and Denver received Andre Iguodala. Howard took six months off from basketball after his April surgery, and only had the combined four weeks of training camp and preseason to prepare for the season. He played in just two preseason games, but was able to play in the 2012–13 season opener against the Dallas Mavericks. He had 19 points and 10 rebounds, but he was only 3-for-14 on free throws and fouled out; the Lakers lost 99–91. Still working himself into shape, Howard paced himself throughout the season on both offense and defense. 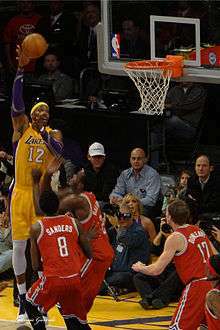 On January 4, 2013, Howard injured his right shoulder in the second half of the Lakers' 107–102 loss to the Los Angeles Clippers when he got his arms tangled up with Caron Butler. He played through the injury in the next game against the Denver Nuggets, a 112–105 loss in which he tied a career high with 26 rebounds. However, he missed the next three games with a torn labrum. At the midpoint of the season, the Lakers were a disappointing 17–24. Howard had not been consistently dominant on defense, and was at times passive on offense. He was averaging 17.1 points on 58.2% shooting, 12.3 rebounds, and 2.5 blocks, but also 3.6 fouls a game with 3.2 turnovers while making only 50.4% of his free throws. The Los Angeles Times criticized his "ability to laugh off missed free throws". Howard shooting against the Milwaukee Bucks in 2013. Many times Howard was upset that he was not getting the ball enough, and he felt that Kobe Bryant was shooting too much. Moving forward, Howard said he needed to "bring it" and dominate in more ways than just scoring. In the following game against Memphis, he had only two points and four rebounds in 14 minutes before he sat out the rest of the game after aggravating his shoulder injury. He returned the following game showing no ill effects from the injury. On January 30, Howard left the Phoenix Suns game early after re-aggravating his shoulder. He was listed as day to day and missed subsequent games. Bryant said that Howard "worries too much" and "doesn't want to let anyone down", and urged him to play through the pain when Pau Gasol was sidelined with a torn plantar fascia. Howard returned the next game after commenting that Bryant was "not a doctor, I'm not a doctor. That's his opinion." During the All-Star break, Howard committed to having a better second half. An avid candy lover, Howard adopted a healthier diet to get into better shape to anchor the Lakers' defense and run D'Antoni's preferred pick and rolls. He looked fresher after the break. Still, on February 23, Howard said he was "not even close" to physically being where he wanted to be. Coach Mike D'Antoni attributed his conditioning to his difficulty with running the pick and roll with Steve Nash, a play the coach had expected would be a staple for the team. The Lakers were 8–2 after the All-Star break, passing Utah for the eighth and final playoff spot in the Western Conference, and Howard had 10 straight games with 12 or more rebounds while averaging 15.5 points, 14.8 rebounds, and 2.6 blocks. In his first game back in Orlando on March 12, Howard scored a season-high 39 points and had 16 rebounds in a 106–97 Lakers win. Booed throughout the game, he made 25-of-39 free throws, setting Lakers records for free throws made and attempted while tying his NBA record for attempts. [lower-alpha 1] Howard made 16-of-20 free throws when he was fouled intentionally by the Magic. With Howard anchoring the Lakers defense and his improved overall play, the team made the playoffs, but they were swept in the opening round 4–0 by San Antonio. Howard was ejected in Game 4 with over nine minutes left in the third quarter after receiving his second technical foul. Howard finished the season with his lowest scoring average since his second year in the NBA, and he made under 50% of his free throws for the second straight year. However, he was the league leader in rebounding and ranked second in field goal percentage. Although he was recovering from his back surgery, he only missed six games all season—all due to his torn labrum. Howard was named to the All-NBA Third Team after five consecutive first-team honors. He became a free agent in the summer, and was offered a maximum contract of five years for $118 million from the Lakers matched with four years for $88 million from other teams. In early July, Howard met with the Lakers, Dallas Mavericks, Houston Rockets, Golden State Warriors and Atlanta Hawks, and on July 5, 2013, announced via Twitter that he intended to sign with the Rockets. He officially signed with Houston on July 13, 2013, joining James Harden to form a formidable duo. With the Rockets, he was initially moved from center to power forward to make room for Ömer Aşık at center. However, with Aşık's under performing play and constant injuries, Howard returned to playing the center position as young forward Terrence Jones moved to power forward. In his first game for the Rockets in the season opener on October 30, Howard recorded 17 points and a career high-tying 26 rebounds in a 96-83 win over the Charlotte Bobcats. Howard finished the regular season with averages of 18.3 points and 12.2 rebounds per game. During the 2014 playoffs, Howard averaged 26 points and 13.7 rebounds per game, but the Rockets were eliminated by the Portland Trail Blazers in the first round, losing the series 4-2. Howard went on to earn All-NBA second team honors. After playing in the Rockets' first 10 out of 11 games to start the 2014–15 season, Howard missed 11 straight due to a strained right knee before returning to action on December 13 against the Denver Nuggets. In just under 30 minutes of play, he recorded 26 points and 13 rebounds to help the Rockets defeat the Nuggets, 108-96. To add to his return, Howard recorded his 10,000th career rebound during the second quarter. However, on January 31, 2015, Howard was ruled out for a further month due to persistent trouble with his right knee. After setbacks forced him out for a further month and a total of 26 games, Howard returned to action on March 25 against the New Orleans Pelicans. He started the game but was held under 17 minutes by coach Kevin McHale and finished with just four points and seven rebounds in a 95-93 win. 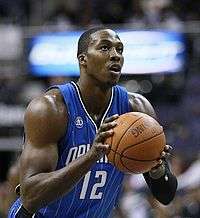 On November 4, 2015, Howard had 23 points and 14 rebounds against the Orlando Magic. He shot 10-of-10 to become the first Rocket to make 10 or more field goals without a miss since Yao Ming went 12-of-12 in 2009. On December 26, he eclipsed 15,000 points for his career in a loss to the New Orleans Pelicans. On January 18, 2016, in an overtime loss to the Los Angeles Clippers, Howard had 36 points and tied a career-high with 26 rebounds en route to his 10th straight double-double, the league's longest active streak, and his longest since a 14-game run in 2012–13. On June 22, 2016, Howard declined his $23 million player option for the 2016–17 season and became an unrestricted free agent. On July 12, 2016, Howard signed a three-year, $70 million contract with the Atlanta Hawks. He made his debut for the Hawks in their season opener on October 27 against the Washington Wizards. In 30 minutes of action, he recorded 11 points and 19 rebounds in a 114–99 win. Howard posted the most rebounds for anyone in their Atlanta debut, breaking the mark of 18 that Shareef Abdur-Rahim set October 30, 2001. On November 2, he recorded a season-high 31 points and 11 rebounds in a 123–116 loss to the Los Angeles Lakers. Howard has amassed several NBA and franchise records and awards during his NBA career. He has led the league in rebounds per game five times, blocks per game twice, and double-doubles three times. He is also the youngest player in NBA history to reach 1000, 2000, 3000, 4000, 5000, 6000, 7000, 8000 and 9000 career rebounds, and the youngest player in NBA history to lead the league in rebounding and blocks. Following Howard's 2009–10 season, he became the first NBA player ever to lead the league in total rebounds for five consecutive seasons. He surpassed Wilt Chamberlain's record of four from 1959–60–1962–63, and again from 1965–66–1968–69. He became the first player to lead the league in rebounding and blocks in consecutive seasons, and was also the first player ever to lead the league in rebounding, blocks, and field goal percentage in the same season. On April 18, 2011, Howard won the NBA's Defensive Player of the Year Award, becoming the first player in league history to have won the award in three consecutive seasons. From the 2007–08 season through the 2012–13 season, Howard led the league in defensive rebounds, a league record. Howard was named on 5 March 2006 to the 2006–2008 USA Basketball Men's Senior National Team program. As the team's regular starting center, he helped lead the team to a 5–0 record during its pre-World Championship tour, and subsequently helped the team win the bronze medal at the 2006 FIBA World Championship. During the FIBA Americas Championship 2007, Howard was on the team which won its first nine games en route to qualifying for the finals and a spot for the 2008 Olympics. He started in eight of those nine games, averaging 8.9 ppg, 5.3 rpg and led the team in shooting .778 from the field. In the finals, he made all seven of his shots and scored 20 points as the USA defeated Argentina to win the gold medal. Standing at 6 feet 11 inches tall (2.11 m) and weighing 265 pounds (120 kg), Howard plays the center position. Howard led the NBA in rebounding from 2007 to 2010, and again from 2012 to 2013. Howard's rebounding is in part facilitated by his extraordinary athleticism; his running vertical leap was tested at 39.5 inches in 2011, rare for a player of his size. He demonstrated this skill in the 2007 Slam Dunk Contest, where he completed an alley oop dunk from teammate Jameer Nelson while slapping a sticker onto the backboard at 12 ft 6 in (3.81 m) high. The sticker showed an image of his own smiling face with a handwritten "All things through Christ Phil: 4:13", a paraphrase of Philippians 4:13. Howard's leaping reach of 12 ft 6 in (3.81 m) is the highest documented in NBA history, 1 inch (2.5 cm) higher than Shaquille O'Neal's previous record of 12 ft 5 in (3.78 m). As of April 2013, Howard's career average of 12.9 rebounds per game (in the regular season) ranked 12th in NBA history. Howard's abilities and powerful physique have drawn attention from fellow NBA All-Stars. Tim Duncan once remarked in 2007: "[Howard] is so developed... He has so much promise and I am glad that I will be out of the league when he is peaking." Kevin Garnett echoed those sentiments: "[Howard] is a freak of nature, man... I was nowhere near that physically talented. I wasn't that gifted, as far as body and physical presence." Subsequent to a game in the 2009 NBA Playoffs, Philadelphia 76ers swingman Andre Iguodala said: "It's like he can guard two guys at once. He can guard his guy and the guy coming off the pick-and-roll, which is almost impossible to do... If he gets any more athletic or jumps any higher, they're going to have to change the rules." As early as December 2007, ESPN writer David Thorpe declared Howard to be the most dominant center in the NBA. While many sports pundits have been rating Howard as one of the top young prospects in the NBA since 2006, Howard has some weaknesses in his game. Offensively, his shooting range remains limited; he is also mistake-prone, having led the NBA in total number of turnovers in the 2006–07 season. Like many centers, he has a low free throw conversion percentage. As a result, he is often a target of the Hack-a-Shaq defense and is annually among the league leaders in free throw attempts. During the 2007–08 regular season, Howard led the NBA with 897 free throw attempts while shooting only 59% from the free throw line. Also in that season, outside of layups and dunks, his shooting percentage was only 31.6%. In the 2008–09 season, he led the NBA again with 849 free throw attempts and in 2009–10, he was second in the NBA with 816. Before he was drafted in 2004, Howard said that he wanted to use his NBA career and Christian faith to "raise the name of God within the league and throughout the world". He has stated he believes in reaching out to his community and fans and thus contributes substantially in the field of philanthropy. An avid listener of Gospel music, he attends the Fellowship of Faith Church when he is back home in Atlanta and is involved and active with the youth programs at the church. Together with his parents, Howard also established the Dwight D. Howard Foundation Inc. in 2004. The Foundation provides scholarships for students who want to attend his alma mater, Southwest Atlanta Christian Academy, and grants to Lovell Elementary School and Memorial Middle School in Orlando, Florida. The Foundation also organizes summer basketball camps for boys and girls, and together with high school and college coaches and players, fellow NBA players are invited to be on hand at the camp. For his contributions in the Central Florida community, Howard received in 2005 the Rich and Helen De Vos Community Enrichment Award. Within the NBA itself, Howard has participated in several NBA "Read to Achieve" assemblies encouraging children to make reading a priority. In November 2009, the center was named one of the 10 finalists for the Jefferson Awards for Public Service, which awards athletes for their charitable work. In 2009, Howard, along with several other NBA players, joined the Hoops for St. Jude charity program benefitting the St. Jude Children's Research Hospital. Along with Sam Worthington and Jonah Hill, Howard appeared in a commercial for the video game Call of Duty: Modern Warfare 3. Howard, along with Carmelo Anthony and Scottie Pippen, also appeared in the 2013 Chinese film Amazing, a joint venture between the NBA and Shanghai Film Group Corporation. In 2014, Epix featured Howard as the focal point of a documentary about his life called "In the Moment". The film was directed by Ross Greenburg and Executive Producers include Michael D. Ratner and Matthew Weaver. On November 18, 2007, Howard's ex-girlfriend, former Magic dancer Royce Reed, gave birth to their son, Braylon. Howard won a defamation judgment against Reed in 2010, when a Florida judge ruled that she violated a court order prohibiting her from mentioning him in the media. He had initially sought $550,500,000 in damages, claiming that she had disparaged him through Twitter and her appearances on the reality television show, Basketball Wives, as the couple's paternity agreement stipulated a $500 fine for each time she mentioned him in public. In October 2014, police in Cobb County, Georgia investigated claims by Reed that Howard abused their son. Howard had admitted to hitting Braylon with a belt, as he had also been disciplined while growing up, and he stated that he did not realize it was wrong. Howard was also involved in a civil case with Reed over custody of their son. ↑ The previous Lakers records were held by Bryant, who made 23 twice—most recently in 2006 against New York—while Shaquille O'Neal attempted 31 in 1999 against Chicago. 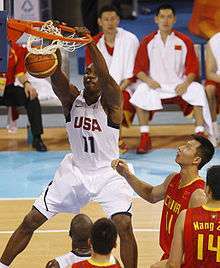 1 2 3 4 5 6 7 8 9 Dwight Howard, usabasketball.com, accessed February 24, 2008. ↑ "Latimes.Com". Los Angeles Times. 1 2 Smith, Aran, "adidas Superstar Camp Asia: Dwight Howard Interview", nbadraft.net, May 27, 2006, accessed July 11, 2007. 1 2 3 4 5 6 7 8 9 10 11 Dwight Howard Biography, jockbio.com, accessed August 2, 2008. 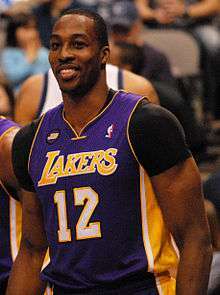 1 2 3 4 5 6 Dwight Howard Info Page – Bio, nba.com, accessed July 11, 2007. 1 2 3 Howard becomes youngest to win Defensive Player of the Year, nba.com, April 21, 2009, accessed April 22, 2009. 1 2 3 4 5 Dwight Howard Info Page – Career Stats and Totals, nba.com, accessed December 5, 2007. ↑ 2005 Award Winners, nba.com, accessed March 28, 2007. ↑ Howard's 20/20, nba.com/magic, November 16, 2005, accessed March 28, 2007. ↑ 2005–06 DIVISION STANDINGS, nba.com/standings, accessed March 28, 2007. ↑ Box Score, nba.com, accessed March 28, 2007. ↑ Raptors win sixth straight home game, tsn.ca, February 7, 2007, accessed March 28, 2007. ↑ Greatest Moment in Amway Arena History, nba.com, accessed October 27, 2010. ↑ Howard Carries Magic Past Sixers, nba.com, April 14, 2007, accessed April 19, 2007. ↑ Long, Mark, Magic Top Heat, Draw Pistons in First Round, nba.com, April 19, 2007, accessed April 19, 2007. ↑ At a Glance 2007, nba.com/playoffs2007, accessed May 1, 2007. ↑ Phoenix Duo Highlights All-NBA First Team, nba.com, May 10, 2007, accessed May 12, 2007. ↑ Medeiros, Andrew, "Around the Association presented by T-Mobile: February 13", nba.com, February 13, 2008, accessed February 15, 2008. 1 2 3 MVP Kobe Bryant Highlights All-NBA First Team, nba.com, May 8, 2008, accessed May 9, 2008. ↑ Schuhmann, John, "All-Star Saturday Dwight", nba.com, February 17, 2008, accessed February 17, 2008. ↑ Magic Beat Raptors, Move to Second Round, nba.com, April 29, 2008, accessed May 1, 2008. 1 2 Feschuk, Dave, "Nelson dangerous, Howard kills", thestar.com, November 18, 2008, accessed November 19, 2008. ↑ Magic Cool Down Pistons in Game 3 Win, nba.com, May 7, 2008, accessed May 9, 2008. ↑ Kobe, Garnett Headline All-Defensive Team, nba.com, May 12, 2008, accessed May 13, 2008. ↑ Schmitz, Brian, "Pistons end Magic's season in Game 5", orlandosentinel.com, May 13, 2008, accessed May 14, 2008. ↑ Grange, Michael, "O'Neal prepares for tall challenge", Globe and Mail, November 17, 2008. ↑ "Without Howard, Magic beat Jazz in Utah". NBA.com. Associated Press. December 13, 2008. Archived from the original on April 18, 2013. ↑ Howard tops balloting for 2009 NBA All-Star Game, nba.com, January 22, 2009, accessed January 23, 2009. ↑ Gonzalez, Antonio, "Magic Switch: Orlando bounces Boston from 2nd", nba.com, March 25, 2009, accessed March 28, 2009. ↑ 2008–09 NBA Season Summary, basketball-reference.com, accessed April 16, 2009. 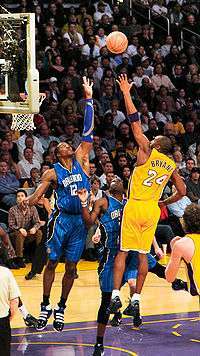 ↑ Howard, Bryant headline 2008–09 NBA All-Defensive First Team, nba.com, May 6, 2009, accessed May 7, 2009. ↑ James a unanimous pick for All-NBA First Team, nba.com, May 13, 2009, accessed May 14, 2009. ↑ Howard's 20–20 night forces game 7 in Boston, sports.espn.go.com, May 14, 2009, accessed May 14, 2009. ↑ Withers, Tom, "Howard scores 40 as Magic make finals", nba.com, May 30, 2009, accessed May 31, 2009. ↑ Lakers and Magic tied at 87 at end of regulation in Game 4, nba.com, June 12, 2009, accessed June 12, 2009. ↑ 2009 NBA Finals Composite Box Score, basketball-reference.com, accessed November 1, 2009. ↑ All-Star starters announced Thursday, sports.espn.go.com, January 21, 2010, accessed January 22, 2010. 1 2 Howard wins Kia Defensive Player of Year honors again, nba.com, April 20, 2010, accessed April 21, 2010. ↑ Joe Johnson scores 23 points as Hawks eliminate Magic, espn.go.com, accessed December 4, 2011. ↑ Robbins, Josh, "Dwight Howard's technical foul in Game 1 of playoffs will stand as called", orlandosentinel.com, April 18, 2011, accessed March 12, 2012. ↑ "Sources – New Jersey Nets in serious talks to get Orlando Magic's Dwight Howard – ESPN New York". Espn.go.com. 2011-12-14. Retrieved 2012-08-11. ↑ Windhorst, Brian, "Dwight Howard explains trade demands", espn.go.com, December 12, 2011, accessed January 26, 2012. 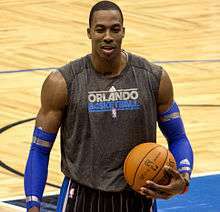 ↑ Dunlap, Evan, "NBA Rumors: Dwight Howard "By Far" Wants to Stay with Orlando Magic; Shane Battier on Magic's Radar", orlandopinstripedpost.com, accessed March 12, 2012. ↑ Dwight Howard breaks FT attempts mark as Magic top Warriors, scores.espn.go.com, January 12, 2012, accessed March 12, 2012. ↑ Dwight Howard becomes Magic's all-time leading scorer in win sports.espn.go.com, accessed January 26, 2012. ↑ Berger, Ken (March 16, 2012). "Howard waives opt-out, agrees to stay in Orlando". NBA Insider. CBS Sports. ↑ Boren, Cindy (April 5, 2012). "Orlando Coach Stan Van Gundy says Dwight Howard wants him fired. Then it gets a little weird". The Washington Post. Archived from the original on March 12, 2013. ↑ Amick, Sam (March 11, 2013). "Dwight Howard apologizes to Orlando from Hollywood home". USA Today. Archived from the original on March 12, 2013. ↑ Hightower, Kyle (July 2, 2012). "Magic GM: Howard has indeed reissued trade request". yahoo.com. Associated Press. Archived from the original on July 2, 2012. ↑ Wojnarowski, Adrian (July 2, 2012). "Dwight Howard: I'll re-sign with only one team". yahoo.com. Archived from the original on July 2, 2012. ↑ "It's official: Howard dealt to Lakers in four-team trade". NBA. 2012-08-10. Retrieved 2012-08-10. ↑ Bresnahan, Mike (February 23, 2013). "Lakers' Dwight Howard still not all the way back". Los Angeles Times. Archived from the original on February 27, 2013. 1 2 3 4 Shelburne, Ramona (February 23, 2013). "Dwight Howard shoulders blame". ESPN. Archived from the original on February 27, 2013. ↑ Pincus, Eric (October 29, 2012). "Dwight Howard confident in back, but still rebuilding". Los Angeles Times. Archived from the original on October 31, 2012. ↑ Deveney, Sean (October 31, 2012). "Dwight Howard's bottom line: He has to produce in LA ... quickly". sportingnews.com. Archived from the original on October 31, 2012. ↑ McMenamin, Dave (January 7, 2013). "Dwight Howard, Pau Gasol out". ESPN. Retrieved January 7, 2013. ↑ McMenamin, Dave (January 14, 2013). "Dwight Howard back in lineup". ESPN. Retrieved January 17, 2013. ↑ Pincus, Eric (January 23, 2013). "NBA analyst Jeff Van Gundy blasts Dwight Howard". Los Angeles Times. Archived from the original on January 26, 2013. ↑ Plaschke, Bill (January 24, 2013). "Dwight Howard is at center of the Lakers' issue". Los Angeles Times. Archived from the original on January 26, 2013. ↑ McMenamin, Dave (January 23, 2013). "Dwight Howard plans to 'bring it'". ESPN. Archived from the original on January 24, 2013. ↑ Markazi, Arash (January 25, 2013). "Dwight Howard cleared to play". ESPN. Archived from the original on January 26, 2013. ↑ "Lakers' Dwight Howard shakes off shoulder injury, spurs victory". SportingNews.com. January 26, 2013. Archived from the original on January 26, 2013. ↑ Bresnahan, Mike (February 3, 2013). "'Leadership' role doesn't fit Lakers, again, but they beat Pistons". Los Angeles Times. Archived from the original on February 4, 2013. ↑ Bresnahan, Mike (February 1, 2013). "Lakers find a road to joy in Minnesota". Los Angeles Times. Archived from the original on February 4, 2013. ↑ "Kobe Bryant urges Dwight Howard". ESPN. February 7, 2013. Archived from the original on February 7, 2013. ↑ McMenamin, Dave (February 7, 2013). "Dwight Howard fires back at critics". ESPN. Archived from the original on March 13, 2013. ↑ Shelburne, Ramona (March 11, 2013). "Dwight Howard: I changed at break". ESPN. Archived from the original on March 11, 2013. ↑ Pincus, Eric (March 9, 2013). "Dwight Howard inspired by Kobe Bryant's dedication". Los Angeles Times. Archived from the original on March 11, 2013. ↑ Pincus, Eric (March 13, 2013). "Dwight Howard needs Kobe Bryant to keep pushing him". Los Angeles Times. Archived from the original on March 13, 2013. ↑ Plaschke, Bill (February 12, 2013). "This is not the Steve Nash the Lakers hoped for". Los Angeles Times. Archived from the original on February 21, 2013. ↑ McMenamin, Dave (March 11, 2013). "Dwight Howard finally finding himself". ESPN. Archived from the original on March 11, 2013. 1 2 Bresnahan, Mike (March 12, 2013). "Hacks and answered: Lakers' Dwight Howard buries Magic at line". Los Angeles Times. Archived from the original on March 13, 2013. ↑ Buha, Johan (May 3, 2013). "Defense was biggest impediment to Lakers' success". ESPN. Archived from the original on May 3, 2013. ↑ "Dwight Howard ejected as Spurs finish sweep of Lakers". ESPN. Associated Press. April 28, 2013. Archived from the original on April 29, 2013. ↑ Plaschke, Bill (April 28, 2013). "Lakers, Dwight Howard need to walk away from each other". Los Angeles Times. Archived from the original on April 29, 2013. 1 2 McMenamin, Dave (May 6, 2013). "2012-13 Lakers Report Card: Starting five". ESPN. Retrieved May 6, 2013. ↑ Trudell, Mike (May 23, 2013). "Kobe Named All-NBA First Team … Again". Lakers.com. Archived from the original on May 24, 2013. ↑ Mahoney, Brian (July 5, 2013). "Dwight Howard tweets that he'll sign with Rockets". Yahoo! Sports. Retrieved July 5, 2013. ↑ "Howard Selects Houston in Free Agency". NBA.com. Turner Sports Interactive, Inc. July 13, 2013. Retrieved July 13, 2013. ↑ "Dwight Howard grabs 26 rebounds in debut as Rockets win". espn.com. October 30, 2013. Retrieved November 22, 2013. ↑ "Harden and Howard named All-NBA". NBA.com. June 4, 2014. Retrieved June 4, 2014. ↑ "Dwight Howard (knee) returns". ESPN. Associated Press. December 13, 2014. Archived from the original on December 14, 2014. ↑ "Howard, Harden lead Rockets over Nuggets, 108-96". NBA.com. December 13, 2014. Retrieved December 14, 2014. ↑ Crouse, Chris (January 31, 2015). "Dwight Howard To Miss At Least A Month". HoopsRumors.com. Retrieved February 1, 2015. ↑ Stein, Marc (February 1, 2015). "Knee woes plaguing Dwight Howard". ESPN. Retrieved February 1, 2015. ↑ "Howard returns, Rockets beat Pelicans 95-93". NBA.com. March 25, 2015. Retrieved March 25, 2015. ↑ "Harden leads Rockets over Magic in overtime 119-114". NBA.com. November 4, 2015. Retrieved November 4, 2015. ↑ "Davis leads Pelicans past Rockets, 110-108". NBA.com. December 26, 2015. Retrieved December 26, 2015. ↑ "Redick's career-high 40 help Clippers beat Rockets in OT". NBA.com. January 18, 2016. Retrieved January 19, 2016. ↑ "Source: Dwight Howard opts out despite Rockets' efforts to keep him". ESPN.com. June 22, 2016. Retrieved October 28, 2016. ↑ "Hawks Sign Eight-Time NBA All-Star Dwight Howard". NBA.com. July 12, 2016. Retrieved July 12, 2016. ↑ "Dwight Howard, Hawks reach deal; Al Horford status in question". ESPN.com. July 2, 2016. Retrieved October 28, 2016. ↑ "Howard, Millsap, Hardaway lead Hawks past Wizards 114-99". ESPN.com. October 27, 2016. Retrieved October 27, 2016. ↑ "Williams lifts Lakers to 123-116 comeback win over Hawks". ESPN.com. November 2, 2016. Retrieved November 3, 2016. ↑ USA Routs Puerto Rico, Advances to FIBA Finals, nba.com/usabasketball, accessed September 4, 2007. ↑ Season Box Score, usabasketball.com, accessed September 4, 2007. ↑ James Leads U.S. Squad Past Argentina to Claim Gold, nba.com, September 2, 2007, accessed September 4, 2007. ↑ USA Basketball Announces 12-Member 2008 Men’s Senior National Team, nba.com, June 23, 2008, accessed July 4, 2008. ↑ US hoops back on top, beats Spain for gold medal, sports.yahoo.com, August 24, 2008, accessed August 25, 2008. ↑ USA, usabasketball.com, accessed 25 August 2008. 1 2 ESPN Sport Science: Superman, espn.go.com, November 3, 2011, accessed November 4, 2011. 1 2 Bucher, Rich, "The man who just can't wait to be king", sports.espn.go.com, December 10, 2006, accessed March 28, 2007. ↑ Just a 42 for 12'6" sticker slap? Bigs get no respect, espn.go.com, accessed March 7, 2009. ↑ Abbot, Henry, "Howard's sticker slam wins buzz but not contest", sports.espn.go.com, February 17, 2007, accessed March 28, 2007. ↑ All Time Leaders: Rebounds Per Game, nba.com, accessed April 18, 2013. 1 2 Chat Transcript: Dwight Howard, nba.com/magic, accessed 28 March 2007. ↑ Thorpe, David, "Scouting Report: What makes Dwight Howard so dominant? ", ESPN Insider, December 11, 2007. ↑ Anthony, Greg, "Biggest man, biggest honors", sports.espn.go.com, December 15, 2006, accessed March 28, 2007. ↑ 2006–07 TURNOVERS LEADERS: Turnovers Per Game, nba.com, accessed May 9, 2008. ↑ NBA Free-Throw Shooting: Total Free Throws Att., sports.espn.go.com, accessed April 21, 2008. ↑ Rovell, Darren, On a mission from God, sports.espn.go.com, May 25, 2004, accessed January 5, 2010. 1 2 3 UP CLOSE & PERSONAL, dwight-howard.com, accessed March 28, 2007. 1 2 Dwight D. Howard Foundation Inc. WHAT WE DO, dwight-howard.com, accessed March 28, 2007. ↑ 2006 Howard & Howard Basketball Camps, dwight-howard.com, accessed 28 March 2007. ↑ Santich, Kate, Accolades pile up for Dwight Howard’s good deeds, orlandosentinel.com, November 25, 2009, accessed January 5, 2010. ↑ Berger, Ken (March 4, 2010). "St. Jude utilizes power of Love, NBA in fight against cancer". CBSsports.com. Retrieved 2012-03-20. ↑ Extreme Makeover: Magic Style, nba.com/nbabuzz, accessed March 28, 2007. ↑ Devine, Dan (June 18, 2012). "Chinese NBA movie starring Dwight Howard and Carmelo Anthony sounds, looks even better than we'd dreamed". Ball Don't Lie. Yahoo! Sports. Retrieved 2014-03-08. ↑ Povtak, Tim (March 29, 2008). "Howard faces paternity suit". Orlando Sentinel. ↑ Saad, Nardine (April 25, 2011). "Dwight Howard goes after Royce Reed in California court to collect on Florida defamation judgment". Ministry of Gossip. LATimes.com. ↑ McCann, Zach (September 17, 2010). "More information from Dwight Howard's lawsuit against Royce Reed". Orlando Sentinel. ↑ Parker, Ryan (November 18, 2014). "Dwight Howard's lawyer calls felony child abuse allegations baseless". Los Angeles Times. Archived from the original on November 18, 2014. 1 2 Cutway, Adrienne (November 16, 2014). "Report: Dwight Howard cleared after child abuse investigation". Orland Sentinel. Archived from the original on November 18, 2014. ↑ "Dwight Howard being investigated". ESPN. November 18, 2014. Archived from the original on November 18, 2014. 1 2 Beasley, David (November 18, 2014). "NBA star Dwight Howard investigated in Georgia for child abuse". Yahoo! Sports. Reuters. Archived from the original on November 18, 2014.